Say hello to the best sammich eva, according to my husband. My husband who didn’t think he would even like the dark rye bread. Pastrami, Swiss cheese, Dijon mustard, and pickle slices – all smushed together in a panini press to make this. This sammich that my husband wanted to eat for days. It’s super simple, but so flavorful!! I used to get pastrami and swiss on rye at Schlotszky’s back in the day, but I’ve never attempted it at home before. Or bought dark rye bread for that matter. 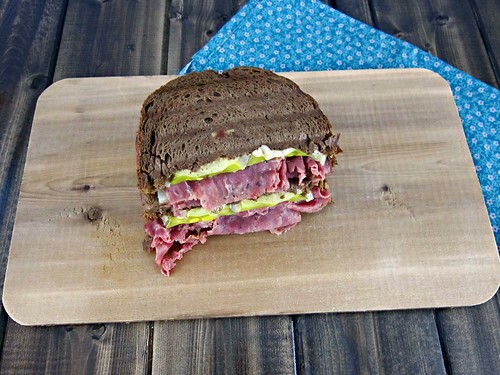 Now, instead of sandwich thins for all-things-sammich, dark rye has become the new favorite. I wanted a thicker bread, because for panini it’s just better. It might smush down and look thin, but it’s perfect. A little crispy from the panini press, and filled with melty, cheesy, tangy, meaty, pickle-y deliciousness. But I really wanted pickles on the sammich so I found a way around it. More cheese! Yep. Cheese on the top and bottom. Keeps the pickles from coming into direct contact with the bread, ergo no sogginess! 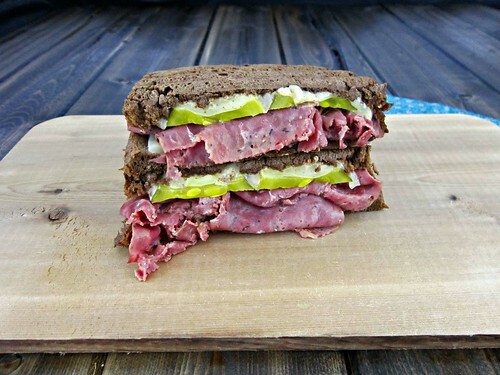 And I must admit, while I love sammiches – so, so many different ones – this pastrami and swiss on rye is most definitely at the top of the list of favorites. Try it and I bet it’ll be on your top list, too!! Preheat a panini press or skillet*. Spread 1 teaspoon of Dijon onto each of the slices of bread. Place a piece of cheese on 2 of the bread slices, then top with 5 or 6 Pastrami slices, 2 pickle slices, another piece of cheese, and top with one of the remaining bread slices. Place one, or both sammiches, in the panini press, close the lid and cook for a couple of minutes, until the cheese is melty and you have nice press marks on the bread. Remove and carefully slice each panini in half and serve! *If you don’t have a panini press, place the sammiches in a skillet and top with a heavy pot. Cook for a minute to brown one side, then carefully flip and repeat, cooking until the cheese is melty and bread is browned.